It’s the indispensible virtue. Especially for anyone out to do comprehensive community development in these hard times. Executive director Bernita Johnson-Gabriel and board chair Shirley Newsome of Quad Communities Development Corp. were among those who persevered for seven years to get the Shops and Lofts off the ground. She’s the executive director of Quad Communities Development Corporation (QCDC). And for a Biblical-sounding seven years she’s been trying to redevelop the strategic-but-blighted corner of 47th Street and Cottage Grove Avenue – a crossroads of Chicago’s historic Bronzeville neighborhood. Two previous deals for a mixed-use, residential-over-retail complex had fallen through. The banks weren’t lending; the condo market went kaput; a hoped-for supermarket chain changed its mind. But Johnson-Gabriel and her unflappable board chair, longtime homeowner and activist Shirley Newsome, just kept plugging away. QCDC worked with the city to create and then guide not one, but two, special taxing districts. 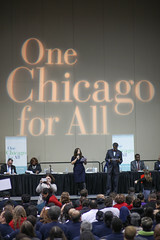 It also worked with wider efforts to redevelop the Mid-South Side, such as the Bronzeville Retail Initiative and the Bronzeville Alliance, which in turn called in expert technical assistance from regional resources like the Chicago Metropolitan Agency for Planning and the non-profit Metropolitan Planning Council. More impressive was the way QCDC leveraged timely booster shots from LISC Chicago and its New Communities Program (NCP). Since 2003, QCDC has been one of the 14 original neighborhood groups partnering with LISC Chicago in this closely-watched demonstration in comprehensive community development. A Walmart neighborhood store will anchor the five-story, $46 million Shops and Lofts development. The biggest dividend, though, just may have sprung from one of LISC’s smallest investments – a couple thousand dollars in 2005 to send Johnson-Gabriel and development consultant Chinwe Onyeagoro to Las Vegas. Las Vegas? It’s where to meet and mesh with thousands of developers, retailers and investors at the annual confab of the International Council of Shopping Centers. The pair went armed with a market analysis by LISC’s MetroEdge research unit, which showed nearly half of Bronzeville residents have incomes above the city’s median, yet a majority shop elsewhere for lack of decent local stores. MetroEdge estimated Mid-South Side shoppers “export” some $450 million-a-year. Most developers weren’t interested, remembers Johnson-Gabriel of the Vegas trip. Then and now it’s easier to sub-divide cornfields than reclaim abandoned corners of the inner city. But one development group, an Ohio-based partnership called Mahogany Ventures, wanted to know more. This was seven years ago. “We’ve had several iterations, but this one will be the best,” she testified to the city’s Community Development Commission, the urban renewal panel that oversees disposition of city-owned land. After she spoke, the commission approved a staff proposal to sell three acres of vacant, city-owned property to the Mahogany group, led by Skilken and The Community Builders. LISC Chicago kept the Shops and Lofts project alive with more than $1 million of pre-development financing over seven years. She might have added, but wisely didn’t, that signing America’s No. 1 retailer to a lease for a 41,000-square-foot “Neighborhood Market” all but guarantees that this time – the third time – is the charm. It’s an apt analogy. To win the fair maiden, the classic suitor overcomes all manner of obstacles, never wavering in his desire for the intended. At first it seemed like a slam-dunk. QCDC’s 2005 LISC-supported quality-of-life plan confidently listed among its goals the redevelopment of Cottage Grove Avenue, once the commercial spine of the Mid-South Side. Special focus was placed on the 47th Street intersection, then site of a grimy, by-the-pint package liquor store. Residential Bronzeville, moreover, was undergoing change on a scale almost unimaginable. The city and the Chicago Housing Authority were tearing down the Wells/Madden low- and mid-rise public housing to the east of Cottage Grove as part of the federally funded (Hope VI) Plan for Transformation. Ditto to the west, where wreckers were leveling the Stateway Gardens and Robert Taylor high-rises – the nation’s largest, poorest concentration of public housing. "They bum-rushed us, and they did it successfully," recalled Adam Troy of Mahogany Ventures, referring to the QCDC team of Bernita Johnson-Gabriel and Chinwe Onyeagoro showing up at his conference booth at the ICSC show in Las Vegas without an appointment. In their place were rising the first of what were to be a forest of privately developed townhouses. There the displaced poor, after getting help to find employment, would live next door to middle-class families, paying market or moderately subsidized mortgages and/or rents. Little wonder the 2010 Census found the population of Quad Communities (Douglas, Kenwood, Oakland and Grand Boulevard) had plunged by 19 percent during the decade. Retail developers, likewise, had counted on an influx of working families with disposable incomes. Many got cold feet. All this may sound familiar because similar versions of this story have been playing out in cities across America. By the mid-2000s, many down-but-promising neighborhoods had been cleared for takeoff … only to find their flight had been cancelled by the recession. “There were a lot of good reasons to walk away,” remembers Joel Bookman, director of programs at LISC Chicago, which over the seven years kept the project alive with more than $1 million in various types of pre-development financing and grants. “But in this case nobody walked away. It was sheer persistence and tenacity on the part of all the partners. There were a lot of types of predevelopment financing, including sources from State Farm and MB Financial." Tenacity? Even as developers and lenders backed off, the city proceeded with land acquisition at 47th and Cottage, eventually buying all 23 vacant lots, plus a three-flat now slated to be rehabbed, plus that liquor store … which is no more. The leadership network of Cook County Board President Toni Preckwinkle (left) helped form the backbone of QCDC, which through Bernita Johnson-Gabriel's leadership "will finally get the wedding." It helped that Mayor Rahm Emanuel vowed in his 2010 campaign to eliminate all the city’s “food deserts. And that, once elected, he extended an olive branch to Walmart … and to any big-box grocer willing to help him deliver on his promise. It helped, too, that Emanuel had asked Andrew Mooney, former head of LISC Chicago, to stay on as commissioner of the city’s Department of Housing and Economic Development. Mooney gets the turf … and the tools. Piece by piece, then, and in spite of the tepid economic recovery, a $46 million deal was painstakingly snapped into place. The CHA agreed to lease long-term 28 of the 72 apartments that will rise to a height of five stories above Walmart and a set of smaller storefronts. JPMorgan Chase will purchase $7.5 million in city tax increment bonds as well as $3.3 million in New Market tax credits. Other financial institutions are purchasing housing tax credits, and the city is fronting both housing bond and neighborhood stabilization (NSP2) revenues.